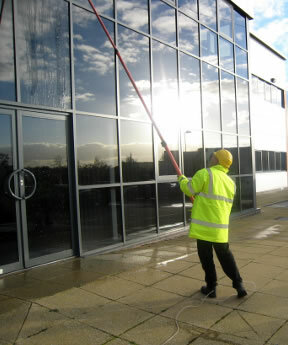 Our commercial window cleaning service is perfect for all premises from shop fronts to larger managed offices. We have the ability and the teams in place to be able to regularly or on a one off basis clean your windows and external glass. We have also worked previously with a number of public sector organisations such as councils, hospitals and schools to keep their windows clean. We can tailor our service to the time of the year to ensure your glass looks its best for as long as possible for you. As every job is completely unique we will happily meet with you and assess your needs in full before providing a bespoke plan for your exact requirements or budget. Some companies will not use the best cleaning solutions – infact some companies use just plain tap water. As this is very hard in our region you can be left with limescale residue on your glass and a less than perfect clean. As professional window cleaners we have an in-house RO (reverse osmosis) water treatment and conditioner. This provides us with pure water that is soft and streak free. By removing impurities and mineral deposits from our water we are able to provide you with a much better glass clean! Window cleaning with the reach and wash system is a relatively new way of cleaning windows, and it has revolutionised the window cleaning industry as the benefits outweigh other cleaning methods. T&H Contract Services have been using this method now for many years. This method of cleaning windows requires 100% purified water which will go through a filtration process called reverse osmosis. The purified water is then pumped through carbon fibre telescopic poles which will reach heights up to 70ft (6-7 floors). 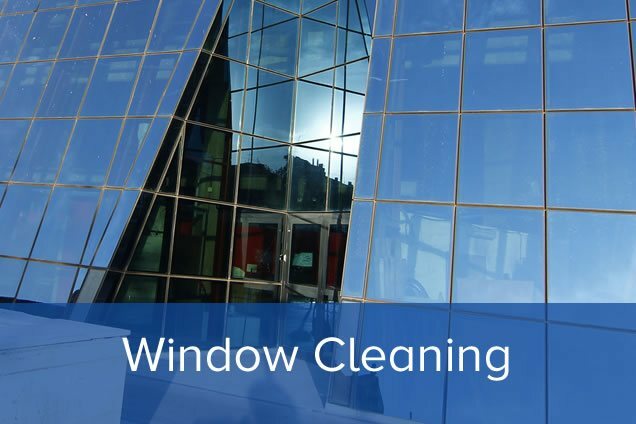 One of the main advantages of cleaning windows with this method is that there are minimal health and safety risks while cleaning the windows and we are able to access high reach windows without having to hire heavy machinery which reduces the cost of window cleaning for our clients. The 100% purified water is excellent for cleaning windows because there is no detergent used which means no sticky residues are left, therefore windows do not soil as quickly and stay cleaner. We are self contained and will not require an external tap to clean the windows. As well as cleaning windows with this system we can also clean, cladding, panelling signs, facia and canopies using the reach and wash system.